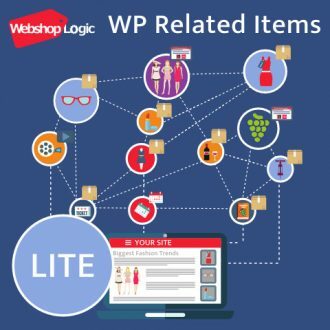 WRI combines automatic, manual and common categorization based relationship management. 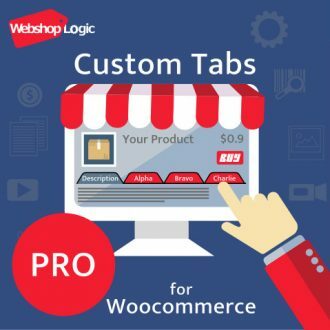 The WP Related Posts and Products Pro product page contains the product description, installation, screenshots, documentation, FAQ, and support. Check if an earlier version of the plugin is installed. If so, deactivate and delete it. Upload the plugin to the ‘/wp-content/plugins/’ directory. The downloaded ZIP file contains a wp-related-items-pro directory, this should be in /wp-content/plugins/ after unzip. Go to Plugins -> Add New menu in wp-admin page of your site, then choose Upload in the upper bar. Choose the plugin file and press “Install Now”. If Lite version or an earlier PRO version (1.1.8 or below) of the plugin was installed earlier, please deactivate it, and then delete it before installing the new Pro version. You can do this in Plugins -> Installed Plugins menu, choose the Lite version of the plugin in the list, then click on Deactivate link, then click on the Delete link in the same way. Please look at the other settings to be performed on the Documentation / FAQ tab. 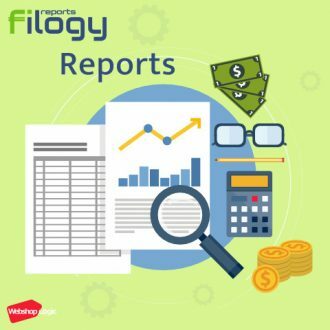 The reference item (what can be called reference page or reference content) is the original content that the user is reading now. The aim is to find related items for this reference item and display them on the reference page (e.g. under the content or on the sidebar). So, the user will see the related items meanwhile reading the reference page (reference item). So if you see an article, and under of it some related products, then the article is the reference content, and the products are the related items. Yes. 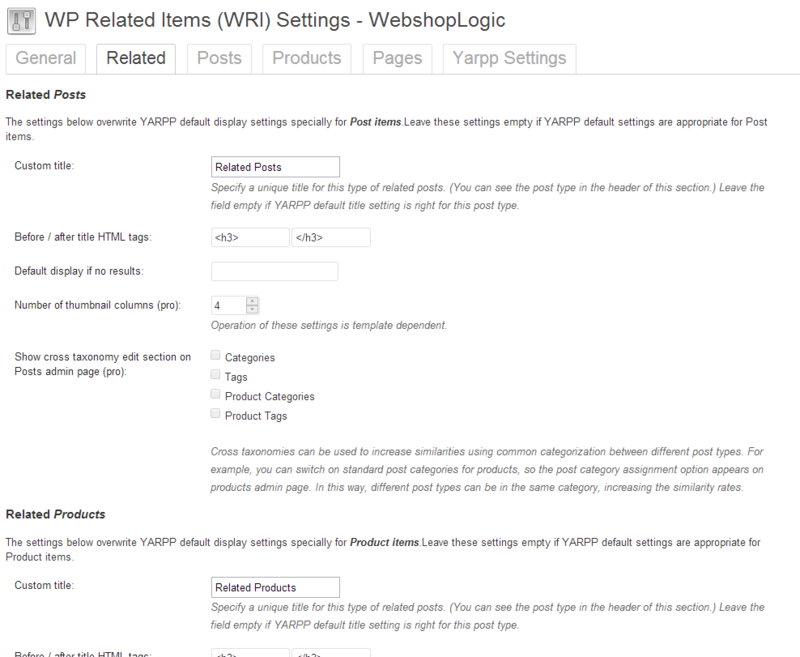 WRI uses the YARPP plugin that supports custom post types. You should switch on all post types that you would like to use as reference post type or related post type on “Settings -> WP Related Items (WRI)” menu, “General” tab “Post types used by WRI” field. For all the selected post types a separate section will be displayed on “Related” tab of “Settings -> WP Related Items (WRI)” page (e.g. “Related Posts” and “Related Products”). 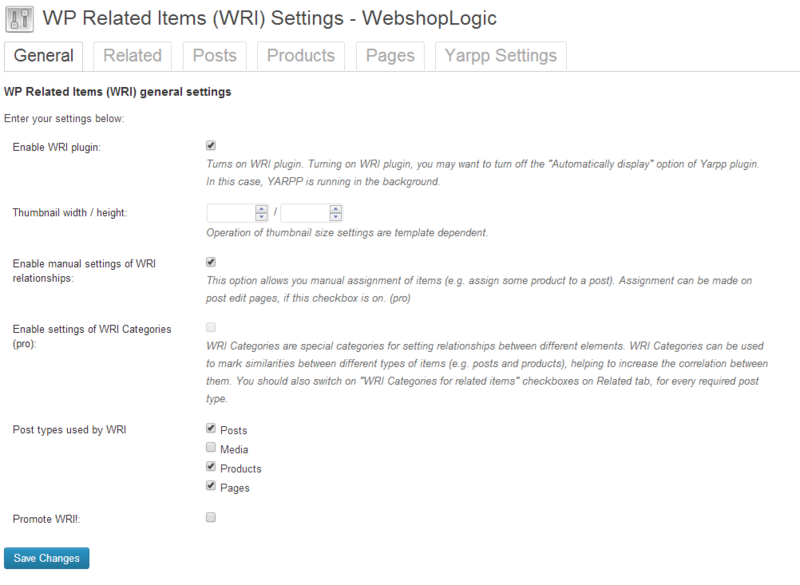 For each selected post types, a new tab will be displayed on “Settings -> WP Related Items (WRI)” page (e.g. “Posts”, “Products”, “Pages). These are the settings pages of the appropriate reference post types. For example, “Posts” tab is for the setting of Post reference page, these settings influence the behavior of finding and displaying related items on the appropriate reference page (e.g. post reference page). On this page, there are several rows, one row for every related post type. The settings of a row influence that particular related post type, inside the reference type defined by the selected tab. These settings are like a matrix, and it is very important, because every reference – related post type variation have different similarities properties, different thresholds. 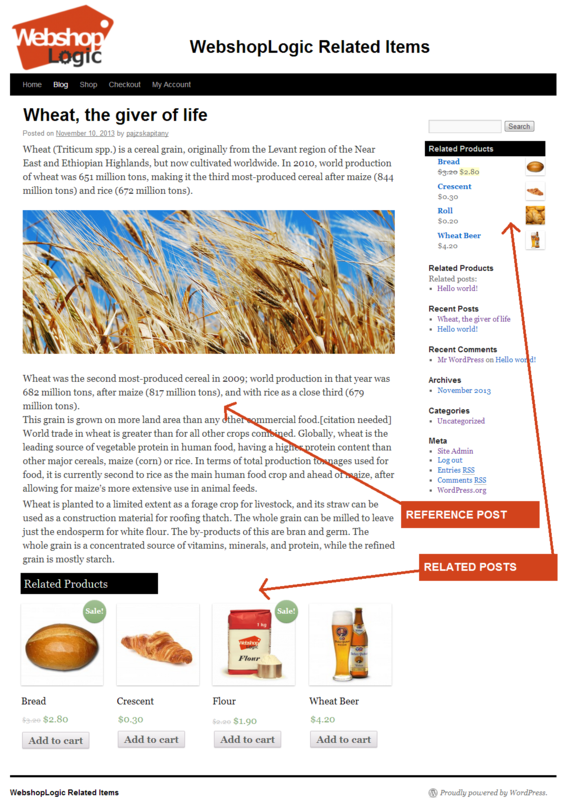 Yes, you can use WP Related Items (WRI) widget to display related items on the sidebar. You should set the “reference post type” that the widget displays. Thus, widgets work contextually for different reference post type. More widget can be used if you want to display different related posts. 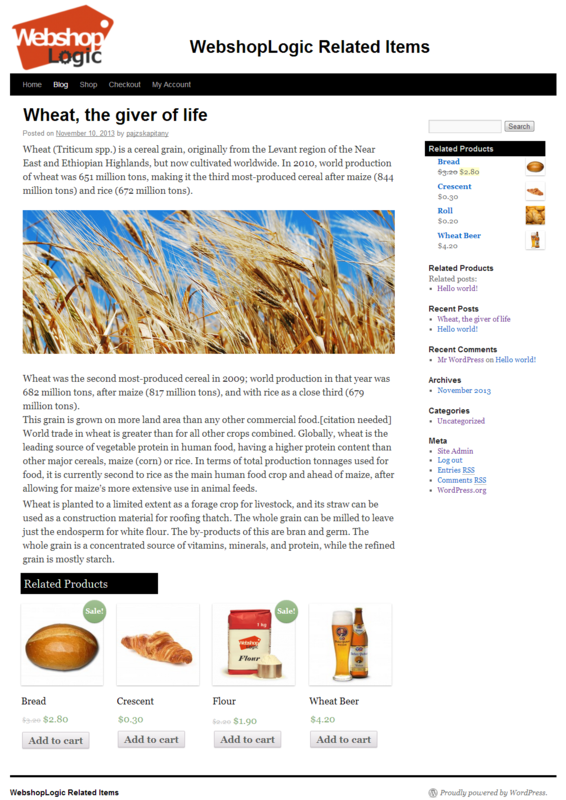 It is possible to display related products on post pages, or other variations of post types? How can I do this? In Lite version only the title and content text similarity is relevant, and no more possibilities to increase relatedness. In Pro version, you have more opportunities to create stronger similarities between different types of posts. In the normal case, posts are assigned to post categories, products to product categories. So, you have two independent category structures for the two post types, and these will not result in relatedness. Pro version ensures to increase similarity by using the SAME CATEGORIES in different post types. For example, you can assign post categories not only to posts but other content types (e.g. to products). You can set the possibility of using cross taxonomy metaboxes on “Related” tab of settings page, in the appropriate related post type section. Then on the appropriate content Edit pages, you can assign your content to other content type categories. So, the two post types (e.g. posts and products) will be assigned to the same category structure, and the relatedness will be strong. 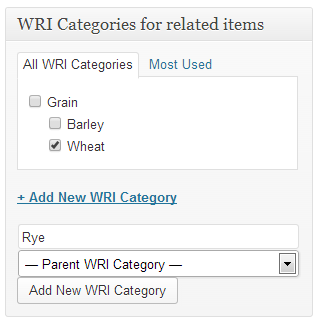 You can use a special similarity maker category type for relatedness reasons: “WRI Categories for related items”. You can set this category type easily for every post type used by WRI on the “General” settings tab. The “WRI Categories for related items” category selection metabox will be available on the edit pages of posts and other post types. In PRO version you have more possibilities. On the Related Types tab, you can select „Categories” checkbox in „Show selected cross taxonomy metaboxes on PRODUCTS admin page”. 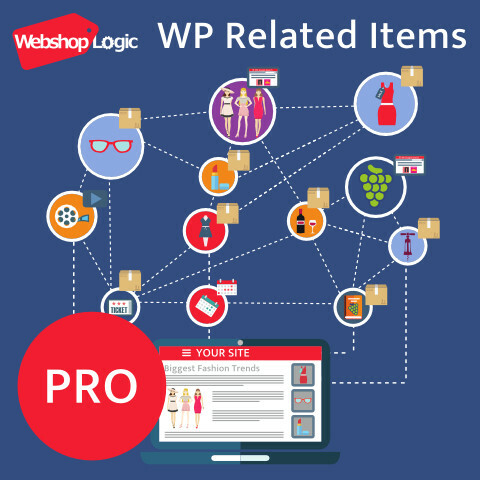 This ensures that the normal WP category selector will be displayed on Product editor admin page, so you can assign your products to post categories. 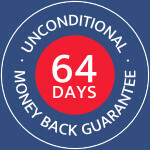 It will result a strong relatedness. Please check if “wp-contentthemes/YOUR_ACTIVE_THEME/wri_template” directory exists. If not, please deactivate and then activate WRI plugin in WordPress Plugins menu. If you change your active theme, please always do this.